My Success Story started in January of 2014 during a trip to Universal Studios. I couldn’t walk for more than 10 minutes at a time, and everyone had to wait on me while I stopped and rested. I was frustrated about being overweight and unhealthy and felt helpless and hopeless as I watched my loved ones from behind, trying hard to keep up with them. I saw how that area of my life was affecting me and others around me, in a negative way. It was then that I realized that I needed to make drastic changes in my lifestyle to improve my health and quality of life. Weighing in at 300 pounds and having a BMI of 50 at 47 years of age, I realized that I wasn’t going to be around much longer unless I became very serious about reaching my goals. I decided that I was actually going to start using my membership at AFF and change the way that I ate. From the very beginning my experience at the gym was a very positive one. I recall thinking about how encouraging and helpful everyone was to help me reach my fitness goals. 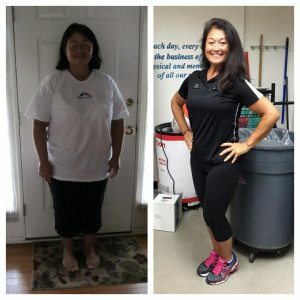 They made me feel like I could reach my weight loss and health goals and walked (baby steps) with me from the very beginning as I started my weight loss journey. There are so many people to thank that I can’t even begin to list all of them; from the front desk staff to the instructors of the classes that I took and amazing personal trainers, everyone has played an important part in my success. I so am thankful for the journey because it has made me become a stronger person, not only physically, but mentally too and now I can fulfill the Mission of AFF because it saved my life. STRIVE, Group CORE, Group ACTIVE, Cycle30, Group POWER and my favorite CENTERGY with Kim.